Aquaholic Aquaculture, LLC is an aquaculture facility dedicated to providing aquarists with 100% aquacultured marine livestock, from live feeds to corals and fish. ​At Aquaholic Aquaculture, all of our products are aquacultured (also referred to as captive-bred), meaning that we produce and raise all of our species here at our facility, as opposed to capturing them from the ocean. ​At Aquaholic Aquaculture, our mission is to be a leader of sustainability within the aquarium industry, fostering successful and flourishing reef aquaria while simultaneously promoting ocean and reef conservation through marine ornamental aquaculture. Currently, the vast majority of species available in the aquarium trade are taken from the wild. Our hope is that one day the number of aquacultured marine aquarium species in the aquarium trade will outweigh the number of wild-caught species, mitigating our hobby's impact on natural marine environments and helping to conserve our reefs and oceans. 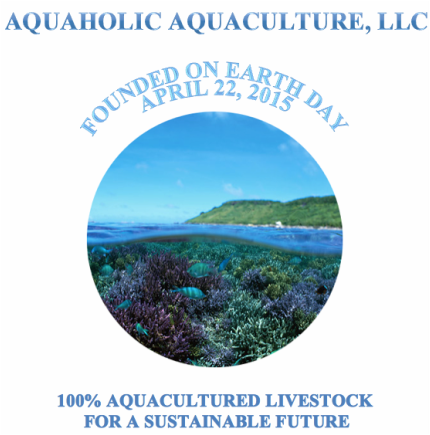 Aquaholic Aquaculture, LLC was founded in April of 2015 in Florida, USA by Samantha Rynn. Samantha's love for the ocean inspired her passion for aquariums as well as her dedication to marine conservation. Aquaholic Aquaculture's mission is grounded in this love for the aquarium hobby and devotion to marine conservation. At Aquaholic Aquaculture, all of our products are 100% aquacultured -- we make it our priority to produce top quality live feeds and livestock sustainably. At Aquaholic Aquaculture, our culture methods are innovative, effective, and backed by the latest scientific research. Our staff's experience in applied research, marine biology, aquaculture, aquarium retail and customer service, and both small and large scale aquarium maintenance enables Aquaholic Aquaculture to produce top quality 100% aquacultured live feeds and livestock at affordable prices with reliable and dependable customer service.